Franklin Roosevelt and the Great Dane Named "President"
Given that Franklin D. Roosevelt was president for 12 years and had a large family, the FDR White House years were filled with many animals. In addition to the president and first lady’s own pets, the mansion was often the temporary home for the pets of the couple’s grown children. 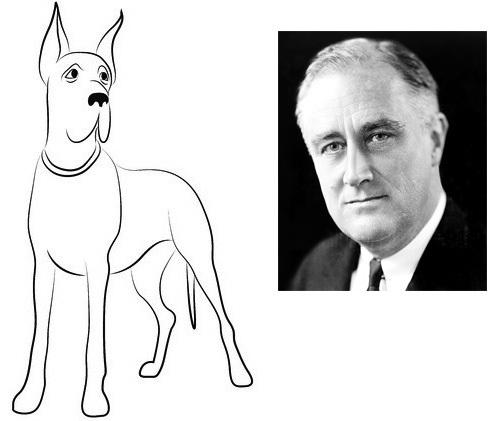 For example, Franklin Jr. left his Great Dane, named President, at the White House during the holiday season of 1937. The dog made another appearance at the White House for the historic visit of the King and Queen of England in 1939. With Europe on the brink of World War II, King George VI accepted FDR’s invitation for a visit to the United States. It was the first time a reigning British monarch had set foot on American soil, so the visit signified a new era in American and British relations. The First Family was anxious that everything go well — and by all accounts, it did. Unlike a few of his White House canine counterparts who bit visitors on occasion, President the dog acted with appropriate behavior and wagged his tail vigorously at the visiting monarchs. Did Any Other Great Danes Live at the White House? As far as we know, this was the one and only Great Dane associated with a U.S. president to live at the White House.